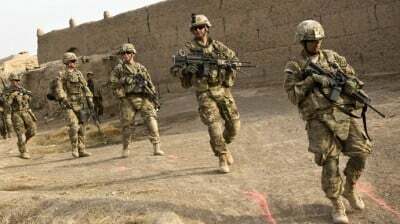 US President Barack Obama announced Tuesday his reversal of a plan to withdraw some 5,000 more troops from Afghanistan. Instead, the present contingent of approximately 10,000 US military personnel will remain in the country until the end of this year. Obama made the announcement at a joint White House press conference with Afghan President Ashraf Ghani. Despite optimistic rhetoric from both Obama and Ghani about the so-called “security transition” and Afghan forces taking “full responsibility” for security throughout the country, underlying the abrupt change in the withdrawal timetable is a steadily deteriorating situation on the ground. The Taliban and other armed groups opposed to the US puppet regime in Kabul are inflicting heavy losses on the Afghan police and army and regaining control of territories that have been abandoned by the US and other foreign occupation forces, particularly in the southern provinces of Kandahar and Helmand. Tuesday’s press conference came in the middle of a state visit by Ghani, who was installed as president last year following a disputed and fraud-plagued election to succeed the longstanding US front-man Hamid Karzai. Ghani was accompanied by his former presidential rival, Abdullah Abdullah, who was named to the newly created post of “chief executive officer” under a power-sharing agreement imposed by Washington last September in a bid to forestall clashes between the two camps. On Monday, the visiting Afghan officials huddled at Camp David with US Secretary of State John Kerry, Defense Secretary Ashton Carter and other US security officials to discuss the growing military, economic and political crisis of the US client state. On Wednesday, Ghani is scheduled to speak before a joint session of the US Congress. Following the Camp David sessions, Kerry announced that the US was creating an $800 million aid fund to “create Afghan self-reliance.” This is over and above the $4 billion to $5 billion—roughly triple the Afghan regime’s annual revenues—needed to fund the Afghan security forces. Obama indicated at the press conference that Washington would continue picking up the tab for these forces until 2017. The US has already spent $65 billion to organize, arm and train the Afghan army and police forces. The total cost of the nearly 14-year war, the longest in US history, is estimated in the trillions. The war has cost the lives of more than 2,215 Americans and left more than 20,000 wounded. There has been no accurate recording of the number of Afghans killed and wounded, but the number is certainly in the tens if not hundreds of thousands. While the Obama administration formally declared the “end of US combat operations” in Afghanistan last December, US special operations troops are continuing night raids and other counter-insurgency actions, while US firepower is still being employed to support the Afghan forces. This is the third revision of the troop drawdown plan first announced by Obama last May. In December, with a larger than anticipated decline in the number of other NATO troops in Afghanistan, the White House announced a postponement of the drawdown of the US force to 9,800. Prior to that change, Obama altered the rules of engagement for US special operations troops, making it clear that they would be used not just to pursue remnants of Al Qaeda, but to attack any forces challenging the regime in Kabul. While Obama insisted there would be no change in his ultimate goal of pulling out by 2017, when he leaves office, all but 1,000 troops comprising an embassy protection force and military assistance group, the realization of that promise is clearly open to question. The decision to maintain the present troop levels in Afghanistan through the end of this year has reportedly been under discussion for weeks. It is a response not so much to Ghani’s request, as to the recommendation of the top US commander in Afghanistan, Gen. John Campbell. The most tangible effect of the troop withdrawal suspension will be the retention of American forces at two key bases in the east and south of the country, where the armed insurgency has dealt some of the heaviest blows against Afghan security forces. Attack helicopters and fighter jets operate out of the bases in Kandahar and Jalalabad, providing air cover without which the Afghan National Army faces being routed. US military commanders have described the level of casualties and desertions experienced by the Afghan security forces as “unsustainable.” While the paper strength of the Afghan forces is 352,000, US officials admit that the real number at present is probably less than 330,000 because of such losses. Civilian casualties, meanwhile, soared by 22 percent last year. At Tuesday’s press conference, Obama and Ghani engaged in banter about having both obtained degrees from Columbia University and about Ghani pursuing the same field as Obama’s mother, anthropology. US officials have described the new president as more “cooperative” than his predecessor, Karzai, who occasionally denounced US night raids and air strikes that killed Afghan civilians and refused to sign a bilateral security agreement allowing US troops to remain in the country. Ghani, who spent a quarter of a century out of Afghanistan—including as an official at the World Bank—before being brought back with the US occupation force in 2001, signed the agreement on his first day in office. US officials have touted Ghani as a technocrat and head of a new government dedicated to carrying out reform and combating corruption. Reality, however, does not rise to the level of this rhetoric. Nearly six months after taking office, Ghani and Abdullah Abullah have managed to fill only one third of the seats on the Afghan cabinet, and many other senior posts also remain vacant. The paralysis of the regime is the outcome of bitter disputes over positions between the opposing camps that backed the two candidates, including rival Afghan warlords. Earlier this month, the Office of the Special Inspector General for Afghan Reconstruction reported that as much as half of all recent revenues from the Afghan customs service has been stolen. The customs service accounts for over one third of all Afghan government income.